One stormy night in New York City, America’s greatest superhero is murdered in his home. Liberty is dead, murdered by his oldest living enemy. The only clue he leaves behind is an encrypted file he sent to his best friend: former sidekick, former arch-enemy, the villain-turned-hero Curveball. One hot night in Farraday City, CB shows up at his favorite bar and learns that his best friend has been murdered. But there’s a problem: Liberty was the greatest unarmed combatant the world had ever seen. The story surrounding his death makes no sense. 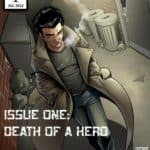 Curveball Issue One: Death of a Hero A hero dies. What is Project Recall? 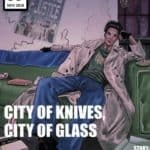 Curveball Issue 35: City of Knives, City of Glass Senator Morgan, racing against time, reveals all.